Welcome to Union Floor Co.
We know wood, we know Portland. We are Portland’s oldest and most respected hardwood flooring company. We have specialized in hardwood floors, and only hardwood floors, for over 90 years. We know wood, and we know Portland, which enables us to deliver the best possible results for your chosen hardwood floor in Portland’s unique climate. We are professional. We arrive on time and work to the agreed-upon project schedule. We do work that you will be proud of at the contracted price. You can always reach us. We know that working on your floors is a big project, and an important part of our job is to make it as hassle-free as possible for you. All our employees are just that, our employees. We feel that retaining quality employees full time, year round, is the key to delivering consistently great workmanship. We do not sub-contract out any of our work. We do not hire temporary staff. When you hire Union Floor, you know that the craftsmen who work on your floor are well trained, skilled and reliable. 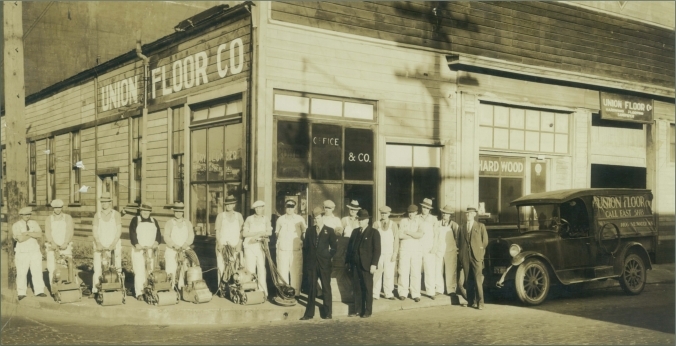 We have been family owned and operated in Portland for over 90 years, and we will be here whenever you need us. Please don’t hesitate to call or email us, even if you are just thinking about a project or have questions. If you would like us to review your project on-site and provide you with a firm quote for our services, please call for an appointment. Let us demonstrate to you the experience, value, and customer service we have been providing Portland for over 90 years.